Auntsfield continues the proud heritage of Marlborough’s first vineyard and winery established in 1873. Our Single Block wines display qualities distinctive to grapes grown within a defined area at Auntsfield Estate. Consistent quality and character over many vintages has separated these Single Blocks out as producing our Reserve Wines. 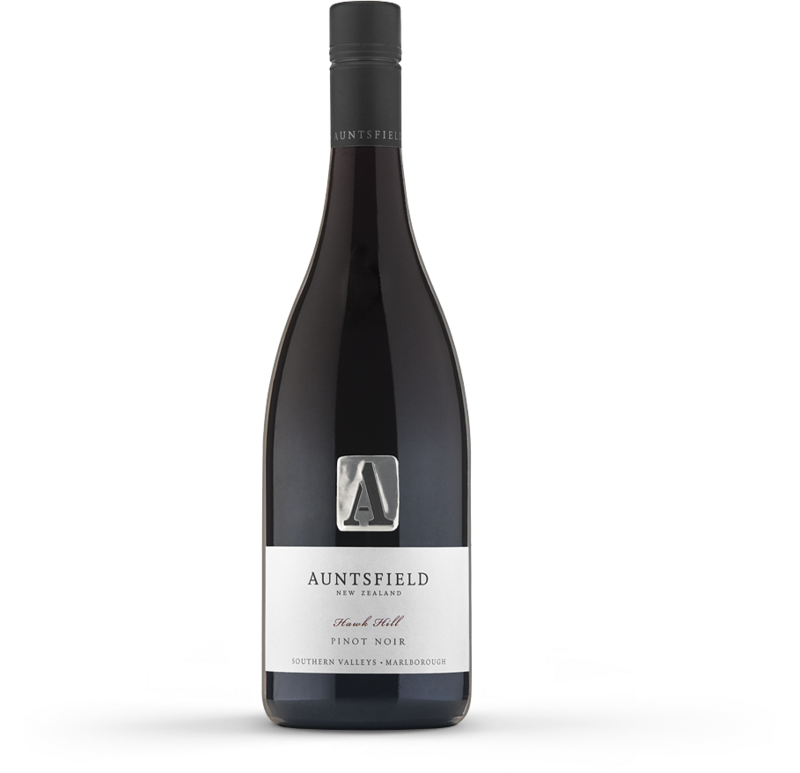 Hawk Hill Pinot Noir – This 4 Hectare block is situated on Auntsfield’s steepest hillside where the Kahu, the native Harrier Hawks, fly the thermal air currents hunting for their prey. This old block of Pinot Noir is one of Marlborough’s oldest on Hill side plantings. AROMA: Lifted primary berry and ripe plum aromas supported by floral notes and other complexing characters. PALATE: Rich and ripe on the palate. Upfront weight and appeal with lashings of oak and tannin that give the wine a bold and lengthy structure. No shrinking violet- this wine is very drinkable and will have wide appeal. WINEMAKER NOTES: The fruit for this wine was hand-picked into small baskets then carefully and diligently hand sorted to ensure that no less than perfect fruit entered the winery. This fruit was then gently destemmed and moved to tank by gravity. A combination of indigenous and cultured yeasts was nurtured through fermentation in open topped tanks. Careful use of hand plunging was used to gently extract the flavours and tannins from the skins. Maturation occurred in French barriques for approximately 15 months. VITICULTURALIST NOTES: Vigour and fertility in this block is very low resulting from the dense Loess Clay and the lack of top soil. Vines are exposed to the strong hillside winds reducing shoot length and reducing berry size. These vines are spur pruned, then extensively shoot thinned and leaf plucked by hand to retain 18 small bunches per vine. The clones Able, 667, 777 and 115 are blended to offer complexities of clone however the distinct site characters of earthy, dense, rich, ripe and savoury characters result from the high mineral Loess Clay soils the vines grow in. AROMA: Berry fruit and dark plum aromas are complimented by savoury and gamey complexing characters including violets and dried spice. PALATE: Rich and ripe on the palate. Very nice upfront weight with generous fruit and volume. Lashings of oak and tannin give this wine a bold and lengthy structure. VITICULTURALIST NOTES: Vigour and fertility in this block is very low resulting from the dense Loess Clay and the lack of top soil. Vines are exposed to the strong hillside winds reducing shoot length and reducing berry size. These vines are spur pruned, then extensively shoot thinned and leaf plucked by hand to retain 18 small bunches per vine. The clones Abel, 667, 777 and 115 are blended to offer complexities of clone. However the distinct site characters of earthy, dense, rich, ripe and savoury characters prevail from the high mineral Loess Clay soils the vines grow in.